t took about an hour for Mantis Burn Racing to grow on me. That first hour is largely spent trying to drift your car around some fairly tight dirt tracks, against CPU opponents that seem to be leaving you far behind. “I’m never going to manage this,” I thought. And then it clicked into place, and I realised how wrong I was. It’s not that the game has a steep learning curve, but there is a brief one. At its heart it is a very arcade-based racer, in a manner that should feel familiar to anyone who grew up playing Micro Machines. Everything is viewed from overhead as you race around various tracks, with you never having to fear about taking damage, but every collision with scenery or rivals costs you speed. 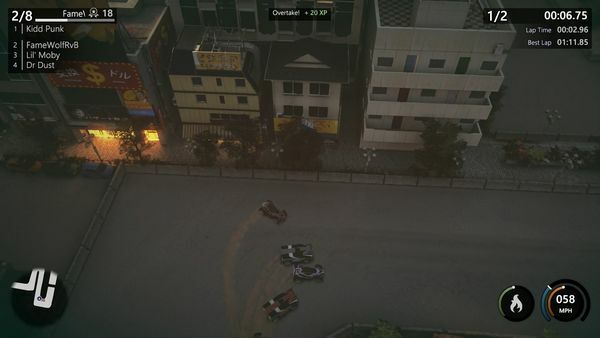 The core single player game is spent in a career mode progressing through several connected race events. An event is considered complete if you finish at least third, allowing progress to any connected events. However, accessing each stage’s final event – and so progressing to the next tier of racing – depends on how many “gears” you’ve won. Winning will always earn three, with an additional one and two for completing two in-race goals, such as managing a particular time, smashing some fences, spending a cummulative amount of distance drifting, and similar. There are a lot of sub-divisions in the game though. 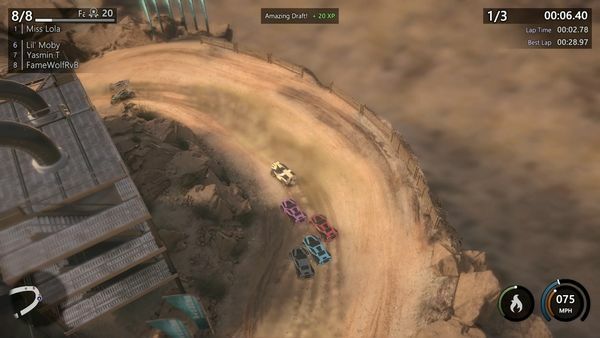 The race tiers are based on your progress – rookie, pro, veteran – and there are light, medium and heavy vehicle events in each of those tiers. Many events are restricted to a single weight category, although some are simply classed as “open”, which can prove fascinating to see just how differently the vehicles handle the same situation (for example, and perhaps counter-intuitively, the light vehicles are slower than the heavies; but their acceleration is far better and the boosts that all cars have effect them more. However, a heavy vehicle avoiding any collisions would use its power to hold more speed). Race events are themselves broken down into many varieties, ranging from the basic of races against opponents, through time trial events, to eliminations (last placed car is removed each lap) and accumulators (you gain points according to your position in the grid; 10,000 points wins, leaving everyone jostling for prime position). There are not a huge number of tracks these events run across though – enough to keep mixing things up, and you’re able to learn at least a few of the layouts, but you will find the same routes turning up several times over. Away from the actual driving, there is also progress in the form of gaining XP for levelling, a way of the game gating the more advanced content from immediate access. The most prominent of these is access to the light and heavy vehicles, and later the pro and veteran versions of all the cars – although if you’re playing like me, you’ll be able to buy the pro cars long before you’re able to enter any pro races. XP is awarded both after the race, based on the results, and during it for various actions. I came to think of it as a reward for “exciting” driving – drift round a corner, get some XP; follow in someone’s draft, get some XP; overtake, get some XP. It also tracks your lap and split times, to be fair – get faster, challenge your personal bests and generally race consistently and you’ll gain XP too… but you’ll get more XP – and satisfaction – when you’re vying with the pack for position. 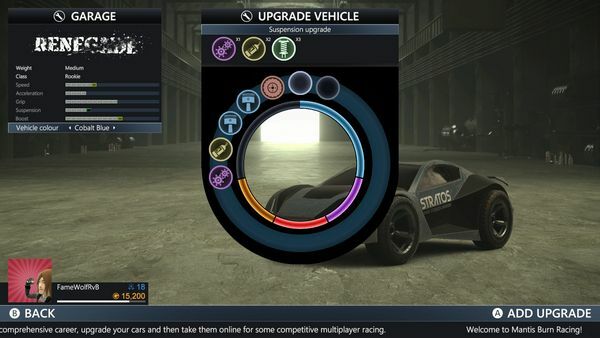 Progress through both the levelling and the races will earn you upgrades to put on your cars, improving your engine, tires, suspension, acceleration or boosting ability. These do make quite a difference, often giving you the edge you need to remain competitive. These are only a limited number of slots on each car, though maximising one vehicle would tend to involve neglecting others, which would in turn harm your general progress. However, if you do fill every slot, upgrades can be removed… though notably they seem to be destroyed rather than returned to your stock. This actually feels like a missed opportunity for the game, as being able to modify your car for the tracks – a little more grip for a tight city course, more power for an open dirt track, for example – would add another layer to the system. So what was the moment when I started “getting it”, where it came together after that first hour? Ultimately, the learning curve had kicked in, realising that drifting corners maintains speed, and a couple of upgrades had also been slapped onto my car giving me an edge too… Once you can keep up with the field, the game changes from chasing the clock to jostling for position, shunting and being shunted as you slide round corners. Perhaps most importantly, mistakes start feeling like mistakes, with a clearer feeling of where you can improve. Simply put, the seeming impossibility watching the field leave me behind in my first race was replaced with the fun of keeping them in their place. It’s fair to say I was far happier going back to those early races I’d barely completed and taking another go. As a side note and disclaimer, there are also multiplayer modes, both local and online, letting you run any of the tracks in any vehicle weight and tier. However, this review was done pre-release before there were many players around, and the multiplayer was untested. Even in single player mode, though, you’ll be presented with the times clocked in by other players, which shows how well you are doing within the game’s wider community. However, based on the solo career mode the core game should be at the very least just as fun, if not more so. Racing games tend to have their own feel to them, and it took a little while for Mantis Burn Racing to get that feel across. But once it had, it proved to be a fun arcade racing game, positively encouraging you to drive a little dangerously thanks to the XP system unlocking more content as you go. It’ll never be confused with a technically accurate racing sim, but as an arcade racer it works very well. Straightforward racing. Absolutely nothing here that should cause anyone any worries.